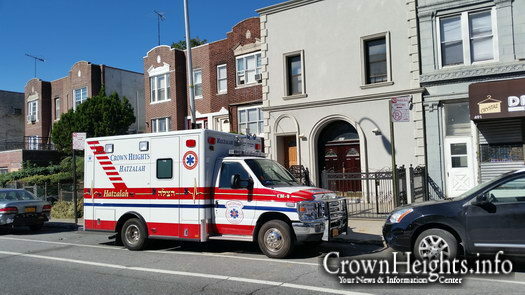 One of Hatzalah's new ambulances parked on Empire Boulevard. 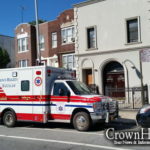 Shuls in Crown Heights all hosted an appeal for Hatzalah of Crown Heights to help cover the immense cost of running their life-saving operations. Hatzalah Volunteers hosted appears in the dozens of Shuls and together successfully raised tens of thousands, with reports that pledges in some Shuls were in excess of $10,000, while many others contributed in the thousands. The money raised goes directly to Hatzalah operations and with the recent expansion of Jewish community, with some families moving beyond Utica Avenue and Kings County Hospital, Hatzalah has had to add volunteers along with additional equipment and a new ambulance. Naturally, all this growth and expansion comes at an increased financial cost. Every new EMT costs in excess of $3,000 in equipment alone. Equipment for a paramedic costs tens of thousands of dollars, with a heart monitor, an essential paramedic tool, costing approximately $22,000. 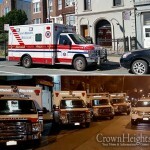 A new fully-equipped ambulance costs around a quarter of a million dollars, and a new CPR machine costs about $15,000. All this is just the cost of purchasing equipment. There are also the running costs – gas, maintenance, insurance for the vehicles, continued training for the members, and the constant need to replace used and expired medications and equipment. Another initiatve that was launched was arranging that Shuls have AED’s along with proper training, and a ‘Hatzalah Phone’ in case of an emergency. They also promoted their heavily subsidized CPR course, offered for just $18! Those who made pledges are kindly reminded that they can honor those pledges by visiting the Hatzalah website and filling out the donation form, or by Clicking Here. I davened downstairs in 770 this past Shabbos & there was NO apeal!!!! We are truly blessed with the dedicated volunteers. But every band-aid, splint, dose of Albuterol and defibrillator pad DOES COST MONEY. Please help pay for it.